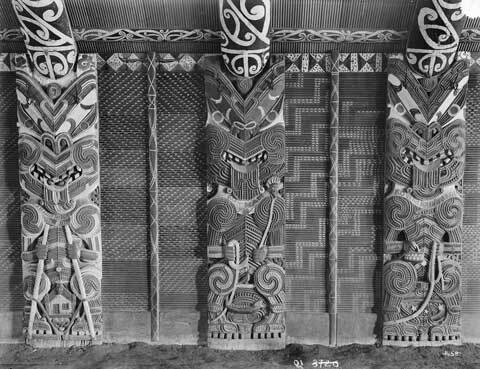 In this carving from Te Tokanganui-a-noho meeting house in Te Kūiti, the figure at right holding the kete (basket) is Whakaotirangi. Both Te Arawa and Tainui traditions speak of this ancestress carrying the kūmara to New Zealand. Te Arawa refer to her basket as ‘te kete-rokiroki-a-Whakaotirangi’ (the secure basket of Whakaotirangi). Tainui speak of ‘te kete-rukuruku-a-Whakaotirangi’ (the small basket of Whakaotirangi).